Despite being one of the most famous gods of the Greek pantheon, Hades was not an Olympian god, despite being brother to Zeus, for Hades was the Greek god of the Dead, and his domain was not in the mortal realm, but was in the Underworld. Hades was of course so feared, and revered, that his name would become synonymous with his domain. Hades was the son of the Titans Cronus and Rhea, making the god brother to Hestia, Demeter, Hera, Poseidon and Zeus. Cronus though was fearful of his position as supreme ruler, and to avoid a prophecy about his own downfall, Cronus would swallow each of his children when they were born. Hades therefore was imprisoned in the stomach of his father. Zeus was the only sibling to escape imprisonment, and when he had reach maturity on Crete he would return to free his siblings. ​Zeus was helped by Rhea and Gaia, and Cronus was presented with a potion that was said to be an invincibility potion, but instead made the Titan regurgitate the imprisoned siblings. Zeus would lead an insurgency against his father, and in the war that followed, the Titanomachy, Hades would play a prominent role. It was during the war that Hades was presented with a Helmet of Darkness by the Cyclopes, this helmet would make the wearer invisible. It was a helmet that Perseus would make use of later, but during the Titanomachy Hades would wear it, and it was he who brought the war to a close, for Hades would sneak into the encampment of the Titans and destroy their weapons and ammunition. Victory meant that the cosmos now needed to be divided between the three sons of Cronus. The division was undertaken by the drawing of lots, and so Zeus became lord of heaven and earth, Poseidon received the earth's waters, and Hades was given the Underworld. Today, it is common to think of the Greek Underworld as Hell, and indeed the name Hades is often used in place of the word hell, but the ancient Greek realm was more than hell, for whilst it contained Tartarus, the hell pit, it also included the Elysian Fields, paradise. The dead would be judged as to how their lives had been led, and eternity might be spent in Tartarus, the Elysian Fields or the nothingness of the Asphodel Meadows. The soul of the departed were therefore the population of Hades' realm, but the god let the judging be done by others, and instead the god simple appreciated the fear and reverence that his position gave him. Sometimes Hades was thought of as being Death, but in Greek mythology there was a separate god for this role, Thanatos, a son of Nyx. Hades had no intention of spending eternity in his domain alone, and so the Greek god of the Underworld sought out a suitable queen. Hades would set his eyes upon a daughter of Zeus and Demeter, the goddess Persephone. 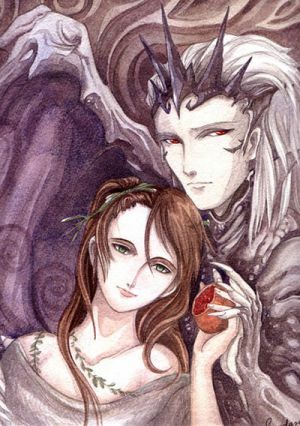 Persephone though would not go willingly to the Underworld, and so instead, Hades decided to abduct her. Demeter was distraught when her daughter went missing, and the goddess neglected her work, and the world suffered a sever famine. 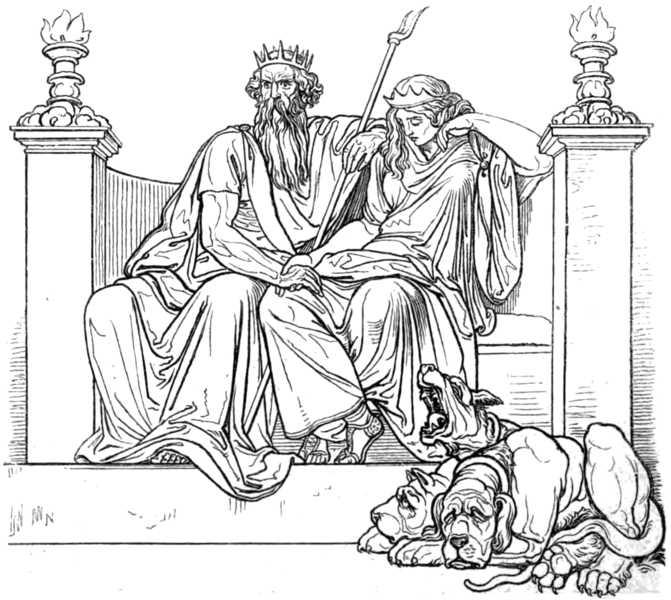 Zeus would eventually order Zeus to release Persephone, but Hades was easily going to give up his bride. Hades would therefore trick Persephone into eating some pomegranate seeds; and whoever eats in the Underworld is bound to it. So Persephone would be forced to spend the autumn and winter period, and the upset Demeter would limit crop growth at this time; but Persephone would spend spring and summer with her mother, and crops would grow. Most people today tend to equate Hades with Satan, but that was not the god's role in Greek mythology. Hades would sit upon his ebony throne, with a sceptre in one hand, and two-pronged fork nearby. When seen travelling, Hades would also be seen in a black chariot pulled by four coal black horses. Arguably though his most famous symbol though, was his guard dog, Cerberus, the three-head offspring of Echidna. Hades would rarely leave his domain, and so stories of the god in Greek mythology were often based around visitors to his realm; and even though no living person was supposed to leave the Underworld, many did. Theseus and Pirithous would travel together to the Underworld when Pirithous decided that he wanted Persephone to be his wife. Hades though was well aware of the plans of the pair, and when they sat down to eat with the god, Hades would ensnare them both within stone chairs. Theseus would eventually be released by Heracles, but Pirithous would remain imprisoned for eternity. Heracles was actually in the Underworld undertaking one of his labours, a labour which involved the kidnapping of Cerberus, but rather than simply take the guard dig, Heracles would ask the permission of the god. Hades agreed to the request as long as Cerberus was not hurt during the attempt. Hades was also merciful when Orpheus came and asked for the return of his wife, Eurydice. The pair would be reunited as long as Orpheus did not look back during the exit from the Underworld, but the Greek hero did glance back, and so lost Eurydice until he himself died. Hades was a feared god of the Greek pantheon, but he was also regarded as a fair one, for he provided a balance to life, and of course everyone died.